After enabling users to launch Google+ Hangouts from Youtube, now users can also connect their YouTube and Google+ accounts. This enables them to view the Youtube Videos shared by their friends on Google+. Youtube earlier had options to add Facebook, Twitter, Reader, MySpace & Orkut, and now Google+ is also part of this list. 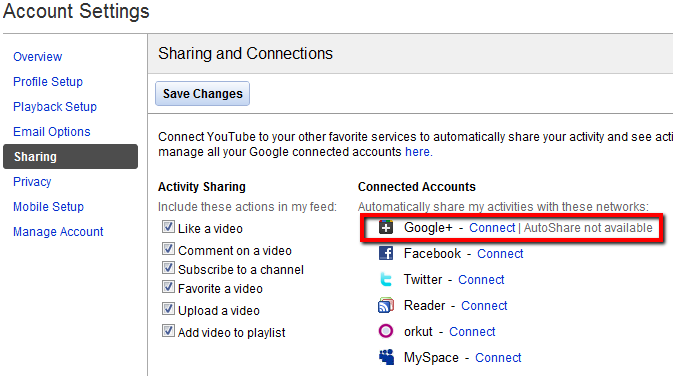 To connect your YouTube account to Google+ go to Sharing section on Account Settings Page (http://www.youtube.com/account_sharing) and finish the settings as shown below.